ZOE IS OPENING A NEW LIVESTREAM STUDIO IN TACOMA! That’s right! Zombie Orpheus is jumping into the livestream world with our very own studio in Tacoma! We have lots of BIG plans including new weekly tabletop adventures, a Patreon-Exclusive Talk Show called Culture on a Stick, and ZOE Behind The Scenes Periscope Streams that will be Patreon Exclusive! 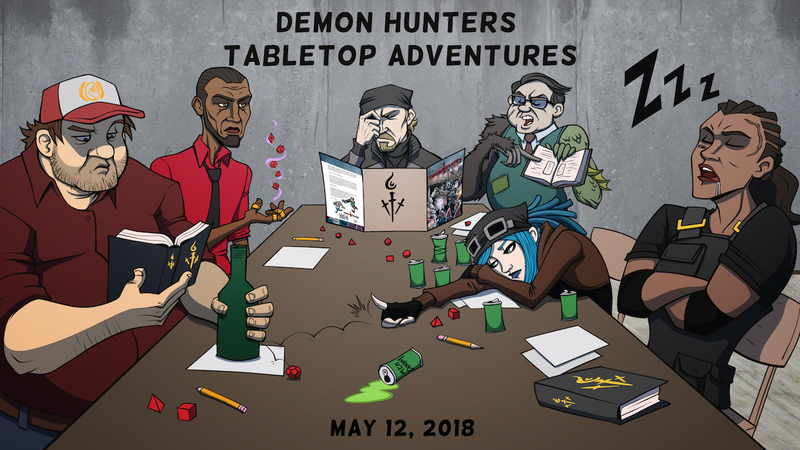 It’s all kicking off May 12th, at 1PM PST with a Demon Hunters One-Shot GM’d by Christian Doyle! There are plans for lots more one shot RPGs to be streamed in the future and we can’t wait to get started! WHERE CAN YOU SEE ALL THIS AMAZING CONTENT? Public livestreams will be broadcast via ZOE YouTube Live and the Zombie Orpheus Twitch Channel! Exclusive livestreams will only be available on Patreon. We’re adding new rewards to many subscription levels, specifically related to the livestreams! All reward levels will be updated with new benefits later this evening. WHAT ABOUT MASTERS OF THE METAVERSE AND DEATH FROM ABOVE? Masters Of The Metaverse and Death From Above WILL be returning as ZOE exclusives! Hyper RPG and Zombie Orpheus have mutually decided to part ways for various business reasons. There is no bad blood between the companies at all, in fact both Hyper RPG and ZOE are extremely excited and supportive of the other’s future endeavors! Hyper RPG was kind enough to completely hand the Death From Above reins over to ZOE, in order to allow fans to continue to experience the story that they have come to know and love! What this means is that Masters Of The Metaverse and Death From Above will no longer be shown on Hyper RPG, but will continue to be streamed in the NEW ZOE LIVESTREAM STUDIO! Start dates and times coming soon! The shows that started our foray into interactive livestreaming are coming back – and exclusively to Zombie Orpheus Entertainment! Following a successful partnership with Hyper RPG, ZOE is moving into a new phase of online collaboration with fans: bringing Masters of the Metaverse and Death from Above straight to ZOE platforms! While a specific start date for both shows is still being determined (nothing locks up an actor’s schedule like giving them time off…), we are confident things will be ready to go soon (and we’ll holler as soon as they are). – Masters of the Metaverse: our highly interactive comedy RPG set in an original universe created by Christian Doyle and Chris Ode. – Death from Above: set in the BattleTech universe, creative control of DfA (Hyper RPG’s longtime flagship show) has been entrusted to Matt Shimkus with the full blessing of its original creative team. Both shows emphasize fan-generated content and ideas with a heavy emphasis on collaborative story-telling and world exploration. We are proud to be bringing Masters of the Metaverse home to ZOE’s own platforms and honored to be entrusted with the legacy of Death from Above. A huge thanks to the folks at Hyper RPG for all their help along the way, and we look forward to partnering with them in the future.